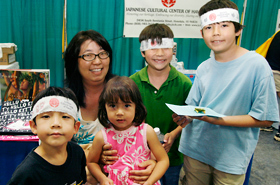 The 17th Annual Honolulu Festival was held for 3-days from Friday, March 11 through Sunday, March 13, 2011. 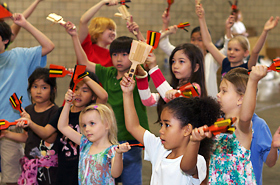 The Educational School Tour was the first event, where the local schools were invited. 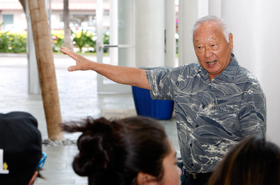 It was held at 9:00 a.m. at the Hawaii Convention Center. 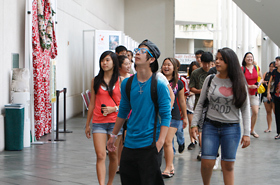 Nearly 1000 students were expected to attend which is more than last year. Unfortunately, many of the schools got canceled due to the tsunami warning that was affected by the Great East Japan Earthquake which had occurred the night before the festival. The tsunami warning was issued after the disaster and it prolonged until the next morning at 7:30 a.m. At the same time, some of the schools were still able to attend the Educational School Tour. 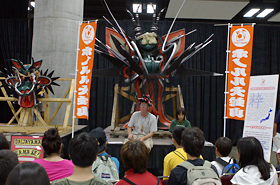 The students were introduced to the Japanese mikoshi (portable shrine) used in the Japanese festivals. They also got to see a cart of the Daija used in the Daijayama of Omuta City in Fukuoka Prefecture. Currently, its head is used by the Honolulu Daijayama. Furthermore, the members of the Free Guide Club at Kyoto University of Foreign Studies introduced about the famous shrines in Japan such as “Kinkaku-ji” and “Kiyomizu-dera”. They also introduced “omikuji” which are fortunes written on strips of paper at the Japanese shrines. The students had an opportunity to draw them, which the members of the Free Guide Club explained what was printed. 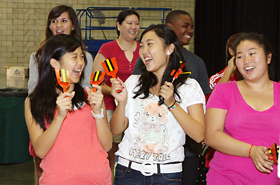 In addition, the students watched the traditional Taiwanese dance and Australian Aboriginal dance. Also, they challenged making hachimaki (headbands) and origami (paper-folding), which those crafts were taken home by them. They are the members of Sugaizanairen. The children’s eyes were shinning. 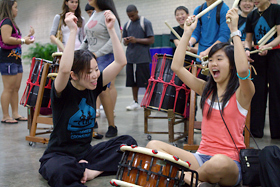 The students challenged the yosakoi dance by imitating the moves of the dancers. 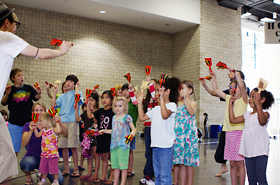 The children were serious in learning their first yosakoi dance. The students thoroughly enjoyed the yosakoi dance. The students learned about the tradition of Japanese festival often called the “matsuri” via the Honolulu Daijayama Booster Group from Fukuoka Prefecture. 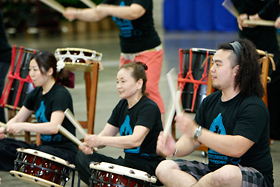 The performance of the Japanese drums is always popular. They are the members of Kaze-Damari from Japan. 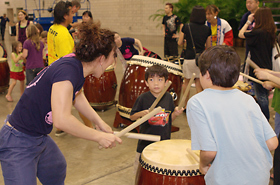 The students challenged playing the Japanese drum. They were looking pretty good. 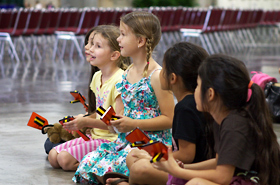 The children were little surprised by the vibrations from the sound of the Japanese drum. 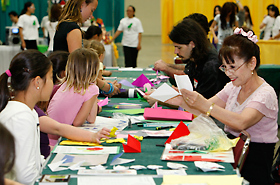 Origami was popular which allows one to be creative. The shape such as flowers and Hello Kitty were girls favorites. 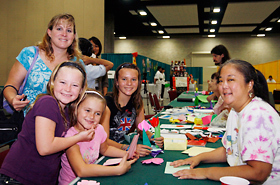 Brianna and her sisters are homeschooling in Wahiawa. 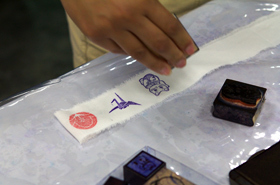 The originality of your hachimaki will be expressed through various stamps of Japanese traditions. Beth and her children are also homeschooling in Kailua.